‘American Horror Story: Cult’ Review: Could This Be the Worst Season Yet? The fear factor of the past six seasons of American Horror Story has been predicated on a variety otherworldly scares. Ryan Murphy and Brad Falchuk have spooked us with ghost stories, aliens, witches, vampires, clowns, and beyond. Part of the uniqueness of the anthology series, and why watching a show as sadistic and gruesome as AHS can be so fun and addictive, is the gap between us and what happens on screen. Who doesn’t love hearing a good ghost story, so long it’s not happening to them? But in its seventh year, American Horror Story pivots from fables of supernatural nightmares to satirize the real-world political fears of Trump’s America, and it’s the series’ biggest mistake yet. American Horror Story: Cult – MILD SPOILER ALERT – opens on a montage of Hillary Clinton and Donald Trump campaign speeches, leading up to one of the most upsetting evenings in recent American memory: Election night, 2016. The episode cuts between two viewing parties in Michigan, showing a home of upper-middle class liberals watching the results roll in with trepidation, and a dark living room where a lone man (Even Peters) watches the news with a gleeful mania in his eyes. Once Trump is announced as the new President Elect, Sarah Paulson’s Ally, a tightly-wound, neurotic lesbian, launches into a hysterical fit. “I can’t believe this is happening,” she screams through tears as her wife Ivy (Alison Pill) attempts to comfort her. Meanwhile in the other home, Peters’ Kai, a 30-year old with blue, scraggly Kurt Cobain-esque hair, cheers in celebration as he humps Trump’s face on the TV. The season’s first four episodes, which were sent to critics in advance, are a hodgepodge of strange ideas that don’t add up to much. 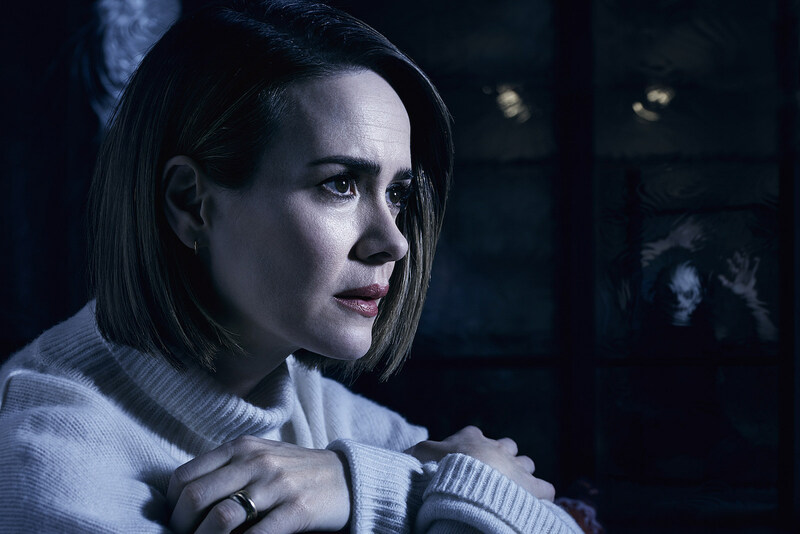 The first three episodes focus on Paulson, who takes the lead again following AHS: Roanoke, but gets little to do beyond screaming and crying in hysterics. Her Ally is a stubborn liberal whose marriage starts to crumble when her deep-seated phobias are triggered by Trump’s win. She has a fear of clowns, who suddenly appear and chase her across town; a fear of blood, which proves problematic when a string of local murders happen around her, and trypophobia, a fear of holes, which partially explains the bee/honeycomb imagery from this season’s promos. What exactly these strange phobias have to do with the larger election plot beats me – the first four episodes fail to connect many dots, which suggests poorly planned storytelling rather that smartly-crafted mystery. But all roads likely lead to Peters’ Kai, a terrifying messianic figure with a dangerous agenda to weaponize the fears of others. Peters, who gets the most screentime in the series to date this season, is thrilling as Kai. He turns up the volume on the sadistic villain he played so well as Hotel‘s Mr. March and blends it with the school shooter, loner-type of his Murder House character. Instead of a haunted house, a witches academy, or murderous hotel, this season’s “horror story” is Trump’s America. In place of the traditional supernatural scares, Cult is about the collective fears unearthed in Americans after election night. That’s quite a tall order to fill for any show, but it’s an especially concerning one for AHS. The FX horror anthology has always been more interested in lurid scares than thoughtful social criticism. Examining the political landscape of the country is something better suited for American Crime Story, which took a more sober and incisive approach to the real-life topics of racism and the judicial system with The People vs. O.J. Simpson. But besides not making a ton of sense, Cult‘s biggest problem is how it exploits the very serious realities of modern America – white supremacy, racist violence, immigration, and “Grab Her by the P—y” misogyny – as fodder for its typical gaudy scares. It’s clear from the jump that Cult intends to mock both the Right and the Left. The season presents caricatures of both progressives and bigots. Billy Eichner’s Harrison is gay man married to his straight best friend (Leslie Grossman’s Meadow) and a Second Amendment advocate with a ridiculous safe full of guns. Billie Lourd’s babysitter Winter cries over Clinton’s loss and criticizes the lack of a trigger warning on CNN's election results. And in a bit of inspired casting, Chaz Bono plays a clichéd MAGA-hat wearing Republican. Cult is clearly making fun of both political sides, but it amounts to nothing more than rudimentary social satire. It’s also shockingly crass and lacking in self-awareness. The most telling thing about this season, and how it jarringly misses the mark, is its cast. 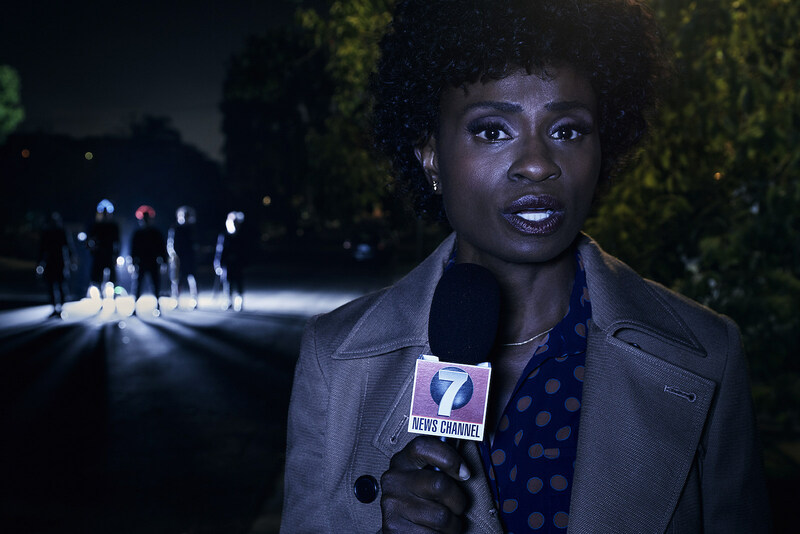 Every lead and supporting character introduced in the first four episodes is white, except for Adina Porter’s newscaster Beverly Hope and Tim Kang as Ally and Ivy’s neighbor. The dread felt by many white Americans following the election is valid, but it’s far from the only one or the one most in need of a platform. If a show is attempting to tell a story about the specific fears of living in 2017 America – notably while making direct narrative connections to immigration bans, racism, and anti-black-and-brown violence – through the perspectives of only white people, it’s already screwed up. I imagine Murphy thinks he’s making a biting critique of white progressive liberalism. While it is a little refreshing that this season follows a queer couple raising a child, at the end of the day Ally is still white and still wealthy. She’s a stereotype of a white liberal who dramatically fears for her safety alone once Trump is elected, and claims she’s a victim when accused of being a racist. Other (white) characters call out Ally for her white privilege, but nothing screams ignorance like white people criticizing white people with no people of color in sight. There’s clearly a sense of irony behind all of this, but the show’s tongue-in-cheek sense of humor is deeply misguided. Without the timely backdrop of the election, Cult could be a fun exploration of creepy phobias and Manson family-inspired murders. The titular cult finally starts to come into formation in the fourth episode, and if the remaining seven installments stick closer to that dynamic than the show’s politics, there’s hope for some recovery. But this season doesn't have the punch or the mystery of previous ones, and Cult‘s cast of characters are among the most uninteresting and underdeveloped in AHS yet. And it fails to conjure significant spooks – when set against the landscape of our present day climate, can anything really be that scary? Cult may find a way to redeem itself in the coming weeks, but so far it’s proof Murphy has simply run out of ways to scare us. The first few episodes may not have many good scares, but if you are afraid of clowns, prepare yourself. Twisty is back with plenty others. The fourth episode is the best of the season so far thanks to Eichner, Porter, and Bono. I still haven’t figured out what’s so mysterious about Eichner’s tank tops. Colton Haynes plays a silver haired detective serving some strong Spike Buffy vibes. No, Lena Dunham hasn’t appeared yet.